There are now more Security Compliance requirements than ever before and with new requirements arriving each year it can be difficult to stay informed. 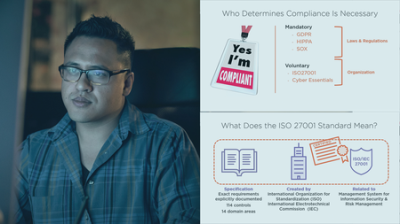 In this course, Security Compliance: The Big Picture, you'll receive a walk through of the major security compliance requirements. First, you'll discover the scope for each compliance program. Next, you'll learn what your obligations are under each security compliance program. Finally, you'll explore the implications of non-compliance, which can be very significant in some cases. Best of all, this course simplifies the security requirements and doesn't get caught up on technical language, allowing you to quickly get an overview of each security compliance program. When you're finished with this course, you'll have developed a foundational knowledge of many security compliance programs and be confident talking to your peers or clients about these programs.